In the early hours of January 18th, 2019 our mother slipped away peacefully. She will be forever loved and remembered by daughters Shan Landry of Saskatoon, and Avril (Greg) Ecarnot of Regina; granddaughters Stephanie (Mike) Klaus of Glen Harbour, SK, Catherine Serrano (Juan) of Regina; great-grandchildren Holly Klaus and JJ Serrano; her sister Sheila Warriner and numerous nieces and nephews. Mona was predeceased by her loving husband Al Landry, sister Ishbel Allin, and lifelong friend Marion Robbins. Mona was born and grew up in Elfros, Saskatchewan. She moved to Saskatoon to complete her secretarial training before beginning her employment with The Modern Press Western Producer where she met her future husband Al. They were married in 1952. Throughout their married life she worked hard to ensure that their home was warm and loving. Mona and Al enjoyed travels to Australia, New Zealand, Tahiti, Fiji, Spain, Scotland, the Caribbean and Alaska and throughout Canada from British Columbia to Nova Scotia. As a dedicated member of Grace Westminster United Church Mona spent many years helping the UCW women of the Mary Martha unit cater at numerous church functions including teas, art shows, funerals and rummage sales. 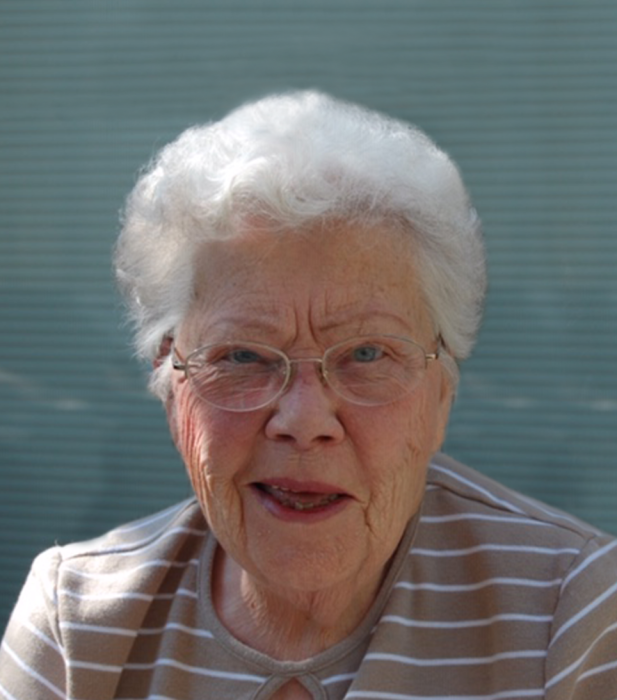 Mom's many friendships meant a great deal to her, some of those friendships starting as a young child in Elfros, some developing upon her move to Saskatoon and marrying, to those friendships developed later in life after moving to Riverside Terrace Assisted Living and the Saskatoon Convalescent Home. The Funeral Service for Mona will be held at Grace Westminster United Church on February 23 at 2:00pm. Reception to follow in the church auditorium. In lieu of flowers, a donation to the Saskatoon Convalescent Home (101 31st Street West, Saskatoon, Saskatchewan, S7L 0P6) or Grace Westminster United Church, 505 10th Street East, Saskatoon, Saskatchewan, S7N 0E3, would be appreciated. Arrangements in care of Chelsea Krentz – MOURNING GLORY FUNERAL SERVICES (306) 978-5200.